There is no shortage of things to do in Wilmington, NC. We should know best since it is the closest thing we have to home as full-time travelers. Wilmington has something for everyone whether you stay on land or water. 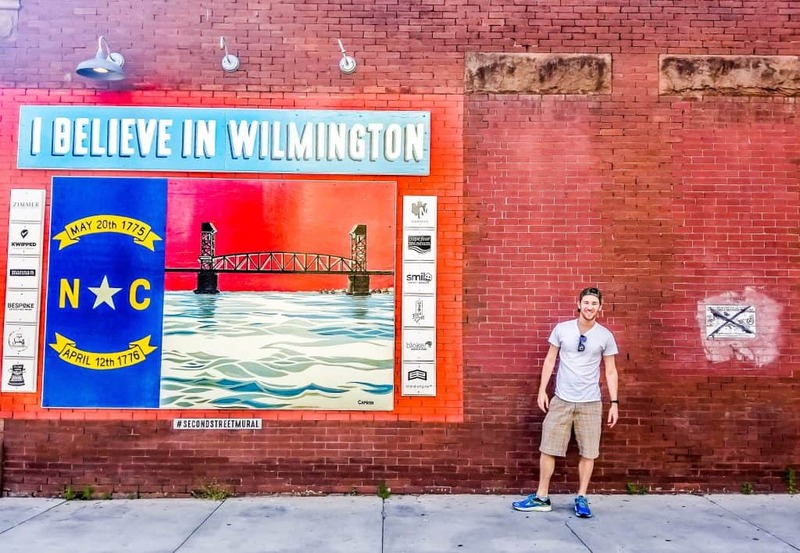 After several years of experience, I wanted to share some of our favorite things to do in Wilmington, NC. If there’s a breakfast spot in Wilmington, it’s Causeway Cafe at Wrightsville Beach. Locals have been loving this little beach restaurant for over thirty years. You can find your typical breakfast staples, but much more delicious than any chain restaurant. Keep in mind that on a Saturday or Sunday morning and you may be waiting in line – at least you’re at the beach! Sadly the restaurant just announced a few days ago that they will be closing down as the owner retires. Stay tuned to see if someone takes over the business or sadly Wilmington loses this institution. Airlie Gardens a 67-acre botanical garden on the way to Wrightsville Beach. If you want a day outside with your loved one this is definitely one of the most romantic things to do in Wilmington. The gardens are filled with oaks, outdoor art, walking paths, and seasonal flowers. This makes it the perfect place to come on a nice sunny day for a picnic. Throughout the year, a number of events can be enjoyed on the grounds. For many who come to coastal town, they have one thing on their mind – fishing. There are many ways you can go fishing in the Wilmington area. However, before you start make sure you have a fishing license to do so legally. Surf Fishing from the beach. Fish in Snow’s Cut and from Carolina Beach State Park. Deep Sea fish with a charter boat from Carolina Beach or Wrightsville Beach. Cast a line off of Carolina Beach, Kure Beach, or Johnny Mercer Pier. Take your own boat of course! Being at the beach and having an awesome downtown area Wilmington plays host to a number of festivals year round. Most of the ones we love are in the spring and summer, but there really is something to do almost every weekend. A few of our favorites are the NC Azalea Festival, the Cucalorus Film Festival, and Wilmington Beer Week. If you’re looking for a weekly event check out the farmers market at Tidal Creek Coop or catch a concert at Greenfield Lake Amphitheatre. I love the beach. So stand up paddle is one of the most fun things to do in Wilmington. Wrightsville Beach was my favorite beach to go to as a college student. It has a completely different vibe here than at Carolina Beach and Kure Beach. I find it to be a bit cleaner and less crowded than Carolina – especially during the summer months. Of course, you can travel to Wrightsville and lounge around, but Wrightsville SUP offers everyone the chance to try to stand up paddle boarding! Wondering what to bring to the beach? Check out our ultimate beach packing list! This is Cameron’s favorite things to do when the weather is nice. 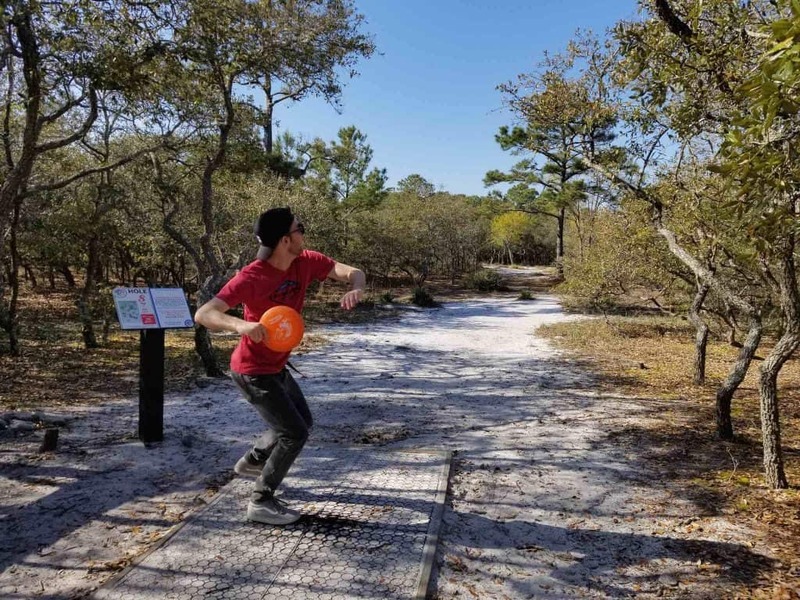 The Wilmington area has four disc golf courses and they’re all free to use. All you need is a disc which you can pick up for $10 at a number of shops around the area. You can find them at Outdoor Provisions, surf shops (CB surf), Dicks Sporting Goods, and a bunch of other places. North Regional Park, Castle Hayne: This course is on the PDGA and it’s the best course in the area. It has 18 holes and a number of challenging par 4 and 5 holes. It’s prone to mud when there is fresh rain, but it’s wonderful on a cool day. Joe Eakes Park, Kure Beach: This is my favorite course because it’s a full 18 holes and has a few challenging holes. What makes it the best for me is it’s all in a coastal forest with sand fairways. The weather is reliable with plenty of water close by, but it also gets windy! Arrowhead Park: 18 hole par three disc golf course. There are plenty of hills that make for fun elevation changes and its in a beautiful little park. Good Hops Brewing, Carolina Beach: This is the easiest course with all of the holes at par 3. It’s also on the breweries property so you can legally pick up a craft beer inside and play while drinking. AWESOME! If you’re in the mood a bit of exercise and like to run there is a great running trail around Wrightsville Beach area. The John Nesbitt Loop, or “The Loop” as referred to by locals is the perfect 2.5-mile running path around the beach. Don’t worry it’s dog and kid friendly and isn’t all runners! If you’re big on running there are other great places to head in Wilmington. Cameron suggests you head to Hugh Macrae Park, Carolina Beach State Park, or the Cross City Trail. When training for a race Cameron would take the trail from UNCW to the loop and back (that’s a half marathon all on a paved trail) so even serious runners will plenty of room to stretch the legs. Check out the Gary Shell Cross-City Trail map here! Downtown Wilmington with its historic building and homes fully deserves to be appreciated. I love our historic waterfront. If it’s your first time consider hopping on a trolley. That’s right – downtown Wilmington still runs modified trolleys through town. Tours run for 45 minutes and cost $12 for adults. If you’re looking for a place to have a nice dinner heading to Historic Downtown Wilmington will provide the most options. They have a number of riverside dining options, which is great in the summertime. One of my favorite restaurants to go to is Little Dipper. Little Dipper is a locally owned fondue restaurant with an intimate setting. They have great specials every day of the week so make sure to check em out online first. If you’re looking for a night out on the town with your friends you have three places around Wilmington. The Wrightsville Beach Bars, Downtown Wilmington, and Carolina Beach. I always found Wrightsville Beach bars to be where the frat guys hung out so didn’t bother going there often, while Carolina Beach is a bit far from Wilmington to go drinking. I wish I knew the number of bars downtown, but trust me when I say there are enough to have a good time. Most of the bars are lined up on Front Street, but they go as far back as 3rd. There’s a bar for just about any type of crowd downtown. There are rooftop bars, clubs, dive bars, breweries, beer halls, country bars, chill bars, and more. There even used to a be a Dueling Piano Bar, but unfortunately, that’s gone now. It may seem a little “younger” downtown, but just remember that Wilmington isn’t just a vacation town, but a college town too. Our favorite bars in downtown Wilmington are Blue Post (dive bar), The Husk, Cape Fear Beer & Wine, Satellite, Duck & Dive, and Barbary Coast. There really are a ton and that’s not even getting into the breweries! If you’re lucky enough to be in Wilmington on a Friday night during the summer make sure to experience the Downtown Sundown Concerts. It’s one of the best free things to do in Wilmington in the summer. Every Friday during the summertime local bands and musicians perform on the riverfront while the sun goes down. It’s almost always cover bands so you know what you’re getting into ahead of time. Downtown Sundowns are free and family friendly, but it’s possible to drink beer and wine there. The Cotton Exchange is where you can find many boutique shops in Wilmington. It’s located in the historic downtown area and is best visited on the weekends when you can see the place really come alive. The vendors sell a ton of antiques, locally made products, and art. One of my absolute favorite things to do when I was in college (and now) was hit up dinner and a movie at Mayfaire Town Center. I know you can do this just about anywhere in the United States, but to me, there is just something really special and nostalgic feeling about going to Mayfaire Town Center, plus it’s perfect for when the weather is crap. Mayfaire is definitely the nice shopping center in Wilmington. It’s got your staple upper-class shops like Williams Sonoma and Pottery Barn, but it’s also got your everyday places to shop like Michaels. Also, they have one of the few H&Ms in the state of North Carolina. To me it’s not about the shops it’s about having a drink at the Fox & Hound before catching the latest movie in a nice theatre. The cinema now features reclining chairs and couches. Want to cool off without getting sandy at the beach? Jungle Rapids is an outdoor waterpark great for families looking for a fun time in Wilmington. They have Two Body Water Slides, a Lazy River and Wave-pool, and a few other fun rides. They also have bowling, golf, go-karts, mini golf, and a rock climbing wall! I’ve been playing volleyball since I was 11 years old so you can bet the first thing I searched for when I moved to Wilmington was a volleyball court. There are two places to play organized beach volleyball in Wilmington. Capt’n Bill’s and Dig & Dive both located close to Market Street. I played on teams, and even worked part-time as a referee, at Capt’n Bill’s for four years in Wilmington and I love the vibe there. Teams from all levels play in leagues and the place can get pretty competitive on the nights with higher league play. There is also a fun bar with food in case you just want to watch. Dig’N Dive is the newer establishment and while organized team leagues also play here, the feeling on the courts is much more laid back. A place where people from all over can come and play free of charge (of course ordering beer and food is recommended). USS North Carolina (BB-55) is the lead ship of the pair of North Carolina-class battleships and docked right in Wilmington, NC. The Battleship is open every day of the year for visitors to come and visit and learn all about the ship that participated in every major naval offensive in the Pacific area of operations during WWII. If you happen to be in town over the Halloween festivities make sure to check out their spooky haunted ghost ship! These days Wilmington is very much a vacation destination, but that wasn’t always the case. Wilmington was, and still very much is a port town. The city was settled by European Americans along the Cape Fear River back in the 16th century. A lot of action happened in Wilmington in those years, particularly in the downtown area near the river. If you feel like stepping back in time. You can get spooked on a Ghost Walk of Old Wilmington. It’s a great thing to do at night, and perfect for anyone! One of Cameron’s favorite things to do when he is home is to kayak around Zeke’s Island. 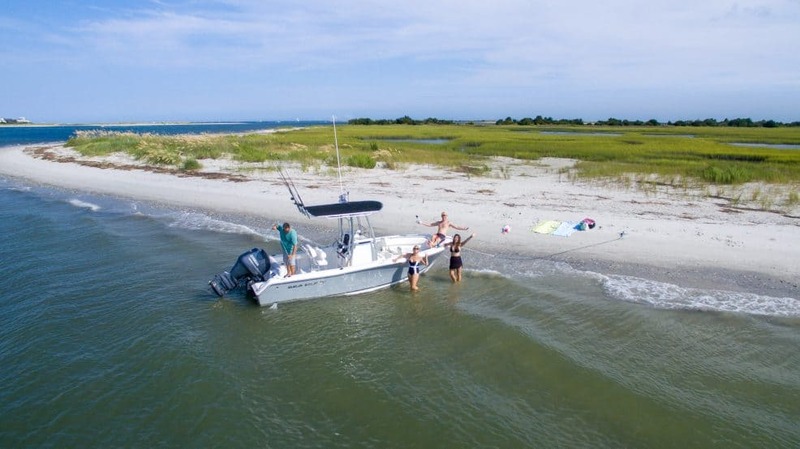 Zeke’s Island is an NC Coastal Reserve only accessible by shallow water boats. Once there you will be able to enjoy the peace and quiet of the coastal marshlands. It’s a great opportunity to see all the biodiversity of Wilmington. There is a boat ramp at Federal Point – adjacent to the Zeke’s Island site to launch from. I would recommend taking a cooler and some chairs for relaxation once there. I wouldn’t recommend crossing the old civil war wall that leads out to the island. Cameron once got caught out there during high tide and it wasn’t a good day – his sister hopped away with 26 stitches in her knee from oyster shells. The North Carolina Aquarium at Fort Fisher is a place where kids and adults alike can visit and learn about marine life. It’s one of our favorite things to do in Wilmington, NC. Unlike some of the mega aquariums around the United States, the Fort Fisher aquarium is a real research center and not a cash cow. The N.C. Aquarium at Fort Fisher is a member of the 230 accredited members of the Association of Zoos and Aquariums. They have a number of exhibits and shows open every day of the year, so no matter what day you visit you’ll be sure to have a good time. It’s here that you can also meet the rare albino alligator named Luna and a rescued bald eagle named Maverick. They also have an awesome butterfly garden in the Spring and Summer. While there are beach bars at both Carolina Beach, Wrightsville, and Kure my absolute favorite place to enjoy the beach nightlife is at Carolina Beach. During the summer a very lively crowd can be found at the numerous bars around the island. The beach bars at Carolina Beach feel much more “beachy” to me than at Wrightsville where the college crowd hangs out. Kure Beach is also nice, but is much quieter than Carolina. We’re Carolina Beach regulars so here are our favorite bars in Carolina Beach. Fat Pelican: This doesn’t only make our list of favorite bars in Wilmington, but the world. It’s eclectic, packed with character, and just crusty enough to make it the perfect dive bar. We love the crowd as there is no age limit here (21+ mind you) and you’ll find every walk of life. Crush & Grind: We love the atmosphere here as its all about craft beer and wine in a modern atmosphere. The owner also makes some amazing coffee – try out the cold brew! ***Update: Post Hurricane Florence the location was destroyed. We will update if the owner reopens. Tiki Bar & Grill: On a nice day it’s impossible to beat sitting on the remains of a pier and enjoying a cold drink. The only negative for us is the price with $5 beer cans and $12 cocktails (We’re not in NYC!). Sea Witch: Live music on the weekends and awesome tiki bar feel. They have a large open courtyard and often draw a crowd in the summer. The Last Resort: This little bar sits right on Carolina Beach Ave, and you can’t miss it! Nollies Taco Joint: There probably isn’t a better bar food than tacos, right? Carolina Beach State Park is one of my favorite places in Wilmington to watch the sunset every day. We spent a month here in 2018 and spent almost every evening in the park. Besides sunsets, it also provides a good platform to fish from and launch your boat into the Cape Fear River. Besides that, we like to come here and enjoy a hike through the woods beneath the amazing trees. They have nice shaded campsites here for campers and RVs. Carolina Beach is also home to the Venus flytrap! That’s right it is home to one of the most famous carnivorous plants in the world and one of the only places you can find it in the wild. If you like to do yoga and you like to go to the beach Wilmington is perfect for you. You can easily bring your own mat to the beach to practice yoga with the sound of the ocean waves. Or if you prefer an instructor and a class there are plenty of those too. Wilmington Yoga Studios and Longwave Yoga both offer yoga retreats, beach yoga, and SUP yoga. If you head to Wilmington Yoga Studios be sure to check out Tidal Creek Coop on the floor below for healthy food. Bitty and Beau was not around while we were in college, but has become a well known national sensation and for good reason! The coffee shop was opened by a local couple who have two children (Bitty and Beau) with Down Syndrome. 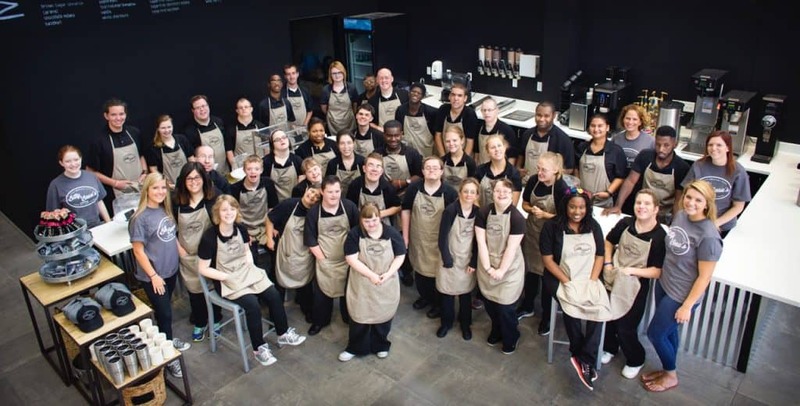 To combat the high employment rate for individuals with IDD and other disabilities the Wrights opened up the first Bitty and Beau in Wilmington and employed people with intellectual and developmental disabilities. They now have two locations and employ over 60 people between the two coffee shops. Oh, Amy Wright may or may not have won CNN’s Hero of the Year. She definitely did win! While the Carolinas have no Major League Baseball team, there is still a collegiate summer baseball league here. The Wilmington Sharks play at Legion Stadium during the summer. It makes for a great evening because! Thirsty Thursdays are the best time to watch. $1 draft beers – no joke. Did you know Wilmington was once dubbed the “Hollywood of the East” or”Wilmywood”? That’s right, little old Wilmington is actually home to a huge amount of film productions over the years. It’s why I chose to get my Film Degree at UNCW. One Tree Hill, Iron Man, The Conjuring, and a ton of Nicholas Sparks’ books turned movies were all filmed in Wilmington. Many movies are shot on location but EUE Screen Gems Studios also plays a huge role in film production in Wilmington. Movie making in North Carolina was much larger while we lived in Wilmington. However, the state legislature voted to end film incentive tax credits after 2014 film production in North Carolina has almost come to a standstill. With almost all movies and TV shows heading to Atlanta these days. Guided tours don’t run here as much as they used to, but for true fans, you can definitely do a self guided tour around filming locations. Lewis Nursery and Farms is a family run business growing all the good stuff on their land – strawberries, blueberries, and blackberries! During the spring season, they allow visitors to pick their own strawberries which is a fun day out. Don’t worry, if you’re feeling a little lazy you can buy the pre-picked fresh berries still. This is state protected land and the entire island is undeveloped. It’s an amazingly beautiful area and one of the last places you can truly experience an untouched coast. Believe it or not, but the mouth of the Cape Fear River and Wilmington is one of the most biodiverse spots in the continental United States – and highest on the East Coast! Best donuts in the world? Everyone and I mean everyone who lives in Wilmington raves about Britt’s Donuts in Carolina Beach. Now I’ve never really been much of a donut fanatic, but I can confirm that Britt’s Donuts are delicious. They’ve perfected the glazed donut, and besides coffee and milk, it is the only thing they sell. Come in the summertime and you’ll likely be waiting in line to try one. Don’t expect to pay with a credit card here. If you feel like mixing it up, head to Wake N’ Bake donuts for some amazing original creations. If you’re wondering what to do in Wilmington when it rains hit up Defy Gravity Trampoline Park. The “park” is a 23,000 square foot facility with wall-to-wall steel-frame trampolines, slack lines, foam pits, and dodgeball arena. If you have a group and looking to bounce around Defy Gravity is your place. This is one of the great things to do in Wilmington for kids. Indochine: Whenever there’s a special occasion we head to Indochine. Indochine is a Thai infusion restaurant and it’s downright amazing and fairly priced. I’ve never been to Indochine, no matter the day or time of year when there isn’t a line. So be prepared for that – but you won’t regret waiting. It is an institution in Wilmington and a must try. Satelite: An awesome bar that often hosts events, live music on the weekend, and draws a hip crowd. Hibachi Bistro: My favorite “cheap eats” spot in Wilmington. Hibachi Bistro serves up cheap and quick hibachi meals, and on Wednesday they have half priced sushi. Dock Street Oyster Bar: If you’re a shellfish fan then this is the place to head. They offer steamed and raw oysters in a relaxed bar atmosphere. Flaming Amys: This colorful restaurant is another Wilmington institution known for its awesome burritos. The Copper Penny: Awesome cheap eats and bar food downtown. Little Dipper: As mentioned before, Little Dipper, is great for a date night or Ladies’ night. Taqueria Los Portales: For authentic, no frills, not “American” Mexican this place is fantastic. Front Street Brewery: Front Street Brewery is…well…A brewery located right on Front Street. They have tasty beers and good food which you can enjoy inside or on the patio when the weather is good. Prices are very reasonable. You’ll probably end up waiting in a line if you come during a nice summer weekend day. 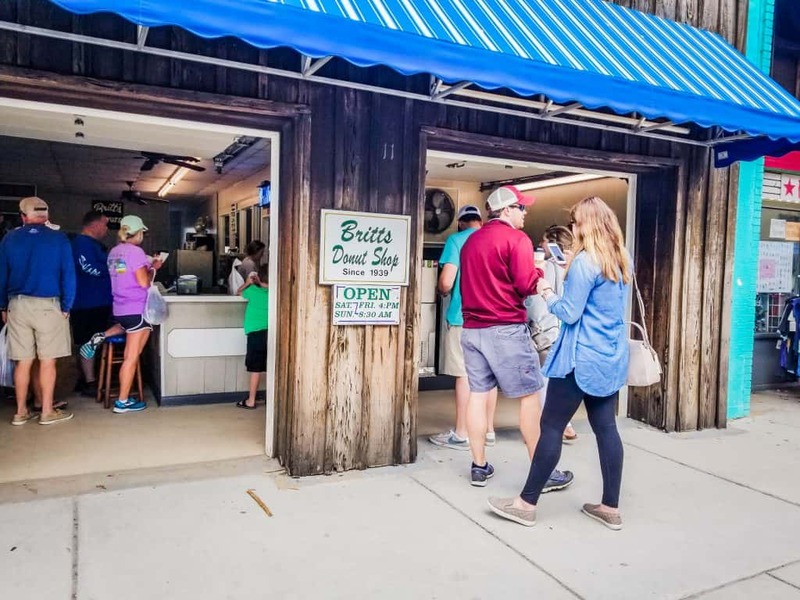 Cape Fear Seafood Company: It doesn’t look like much on the outside, and it’s not ocean front, but Cape Fear Seafood Company serves fresh local reliable seafood. Slice of Life: Hands down the best pizza in Wilmington. Where To Stay in Wilmington? Everyone in Wilmington knows Mayfaire as the nice shopping center with a great movie theatre, restaurants, and name brand shops. The Hilton here has great reviews and is only a few minutes from Wrightsville Beach. This is the newest hotel on Carolina Beach and has a modern interior. We haven’t stayed here, but have popped in to grab a coffee and have a drink on their back deck. Looks nice and they have great reviews. The hotel is located right on the boardwalk so your steps away from the beach. Great location right downtown next to the Wilmington Convention Center. If you want to explore more of historic Wilmington or have business in the city this would be a great choice. The vast majority of people head to the coast here and use a vacation rental service – if resorts are your thing this isn’t the place for your vacation. Cameron’s family runs a few Airbnb’s in Carolina Beach. They are amazing, a good value, and his mom even has the Superhost status. Check them both out here and here. After Hurricane Florence the beach condo received extensive flooding, it’s still standing but needs a renovation – should be open for 2019 summer. New to Airbnb? Here is $30 off your first booking! Read more about choosing a good Airbnb here. I made the move from Michigan to Wilmington, NC when I was 19 years old. In search of a different lifestyle in the South and a college degree. Wilmington became my home while I attended the University of North Carolina Wilmington. People often asked me why I moved to Wilmington, and the truth is I was searching for an “out” of the harsh Michigan winters. I literally Googled “Universities on the beach” and the rest was history. It took me one day in the city to realize I picked an excellent school and home and that I was living where other people vacation. I think the decision to move to North Carolina completely changed the path of my life as well. I got involved in some great programs while in college, used my schools study abroad program to venture out to Australia, fell in love with travel, and now I run a travel blog for a living and have traveled to over 65 countries. Cameron and I also met in Wilmington, and now travel back here every year when we want to slow down for a bit since Cameron’s family has a home here. We both very much consider ourselves locals and that’s why it pains me to see vacationers here doing the same few things day after day. So hopefully these 30 unique and different things to do in Wilmington, NC will help you discover something new on your trip! Oh, and Cameron has even been on the local news… We kind of get this place. Did someone take over the Causeway Cafe? I’d love to try their food sometime. What dishes would you recommend?